Savory items get a thumbs up! Sweet items – not so much. There is a lot of fun and unique food at Shanghai Disneyland. Most of it is good, but I was so disappointed in the flavors of the sweet items. Could it be a cultural thing? Inside the park there are a few places to sit down to eat, but only one table service restaurant – the Royal Banquet Hall. Primarily Shanghai Disneyland is populated by what they call “Grab and Go” places where you stop in and grab a bite to take with you in line or find a spot somewhere to eat. They do have restaurants where you can sit-down but those are not table service either. Instead they are served either cafeteria-style or you order at a stall and pick up your food at the window. Some of them are really good or at least interesting, but if you’re looking for a table service experience, you’ll have to go outside the park. We tried one of the sit-down restaurants in the park on our first day and it was really good. Again, not table service, but the food was more than a cut above normal park food fare. The Wandering Moon restaurant located just outside Adventure Isle had lots of great traditional Chinese dishes. I thought it was cool that most sit-down restaurants in the park always had an option for a family-style meal where you could share food together, instead of the Western way of serving individual dishes. We opted for the individual dishes but I would definitely be in the mood to try one of the family-style options. At Wandering Moon, Cassie and I both tried the steamed pork belly. It came with rice, bok choy, and little tofu wraps. Really yummy. I’m used to crispy pork belly or pan fried so this was a different experience. Cassie also tried the red bean paste drink which was served warm and in a souvenir bamboo cup. It was like drinking the inside of a manju (sweet Japanese pastry). Fun but very different. Unlike Western Disney theme parks, Pepsi products are the featured soft drink so I just had a 7-up. Longest line in the park? Might be for the turkey legs. Okay maybe not. But still! Would you wait in this line for a turkey leg? If you’re looking for Western-type food in the park, no worries. While you will find some food specific to the Chinese or Asian culture, burgers, pizza, pasta, and BBQ items can be found at various locations, too. As I mentioned in the Attractions post, turkey legs are a big deal and if you don’t have one on your visit many locals would consider it a bad day. Another popular food item are the corn dogs. For the life of me I don’t know why but they seem to be more popular in Shanghai than in America. 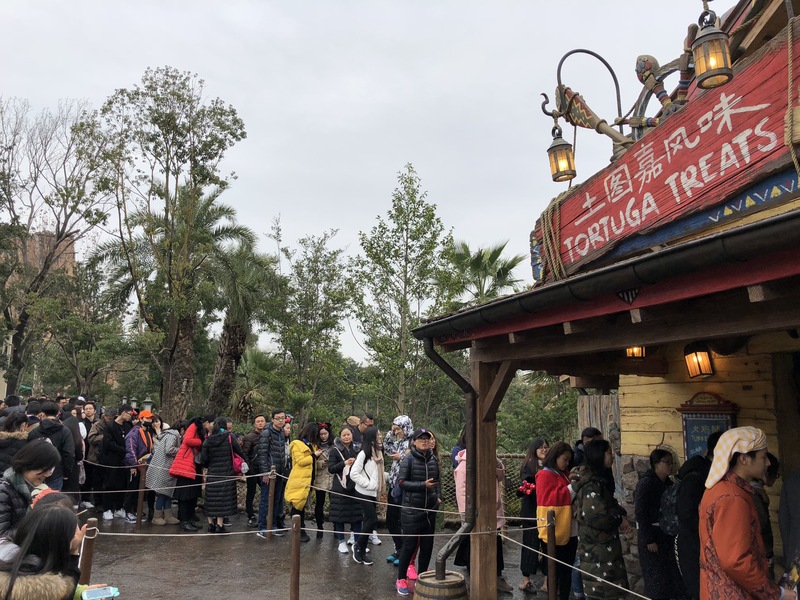 We spoke to a cast member from the management team (who was fluent in English) and he told us that despite Disney’s effort to make things authentically Chinese, many of the visitors craved something different. Thus the popularity of things like turkey legs. 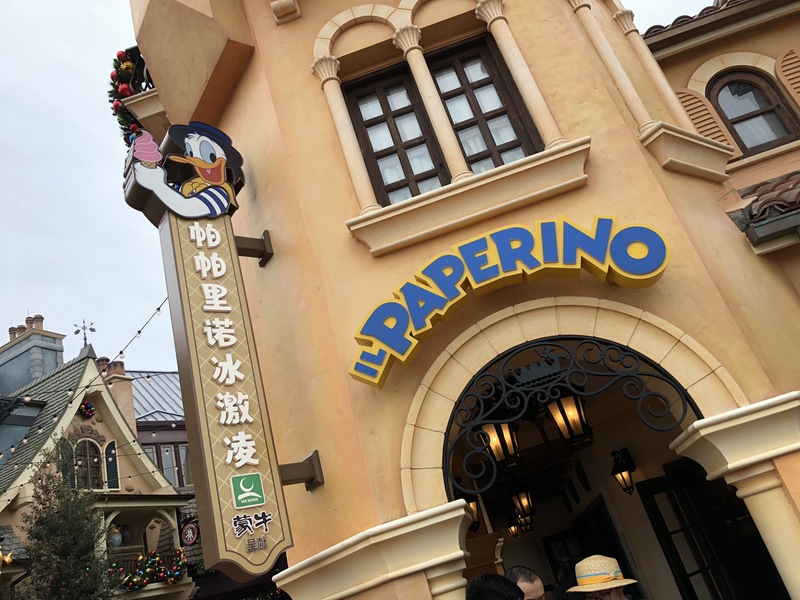 Il Paperino features Donald Duck as its main character, but what Donald has to do with ice cream or waffles is beyond me. It was weird to me that none of the popcorn carts had regular popcorn. Every popcorn cart specializes in caramel corn which surprisingly isn’t very sweet. Either is their cotton candy. I didn’t know you could make cotton candy that wasn’t dominated by a sugar rush, but they did. It had a lighter and more subtle flavor although they gave you a TON and decorated it with an edible Olaf sticker. We tried the ice cream at Il Paperino and was unimpressed. It looked great, but lacked the sweet flavor you expect from ice cream in the states. We asked our friend the cast member about that, and he mentioned that for most of the visitors, the look was more important than the taste. In a culture where selfies are a way to show status and prestige, getting a cool pic with something distinctly Disney was more important than the actual flavor of the item. I just can’t wrap my head around that! But I did love the savory items – even if some of them had funny names. The sausage roll at Spiral Snacks in Tomorrowland was really good. Light and flaky crust like a croissant with a sausage filling, it was tasty with a good balance of meat and crust. We tried the “potato gems with meat floss” and liked it – basically tater tots with a mustard sauce and what we think are fried meat shavings. Lots of things had “floss” (even the corn dogs) but it tasted good. The Shanghainese pork moon cake was awesome. Had a couple of those. Basically, again a light flaky crust shaped in a circle with a Mickey Mouse stamped in red on top with a BBQ pork filling. Every spring roll I tasted was great no matter the location. Fried just right with a light crispy shell and a steaming interior. The Mickey BBQ pork bun was good but if you have to choose, go for the pork moon cake instead. Definitely worth it. If you’re in Shanghai Disneyland, just remember the sweets are not American level of sweetness. But the savory items are often tasty and will delight your stomach. And don’t worry if you want a break from Asian food because there are plenty of options both inside and outside the park. Let me know what it is you love at the park!